We have recently added two new features to our eField Note system (assessment of Entrustable Professional Activities for new residents and assessing Patient-Centered Observation skills for all residents) and have changed the automatic sign-off of eField Notes, which are now automatically signed off after 60 days. What are Entrustable Professional Activities? The Association of Faculties of Medicine of Canada (AFMC) has defined a set of 12 core abilities that every medical graduate will be able to perform as they transition into residency. More information is available on the AFMC website. Please attempt to use this feature for all new PGY1 residents, and especially for IMGs, in the first few weeks of residency so that all 7 EPAs are assessed within their first two blocks of FM (as this is a “soft” implementation, we have not made this mandatory, but “encouraged”). It is important that our new residents arrive ready to “hit the ground running.” Medical school prepares students to succeed – let’s ensure we document their skills and readiness! 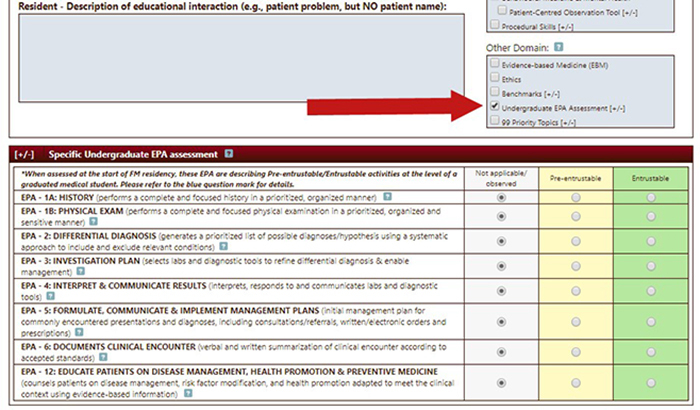 The feature appears after checking off “Undergraduate EPA Assessment [+/-]” in Other Domains (see below). The level of entrustment is explained by clicking on the reverse highlighted question mark for each EPA (see below). We believe that early assessment will help you, as a preceptor, to identify a “pre-entrustable” resident who may need academic support. 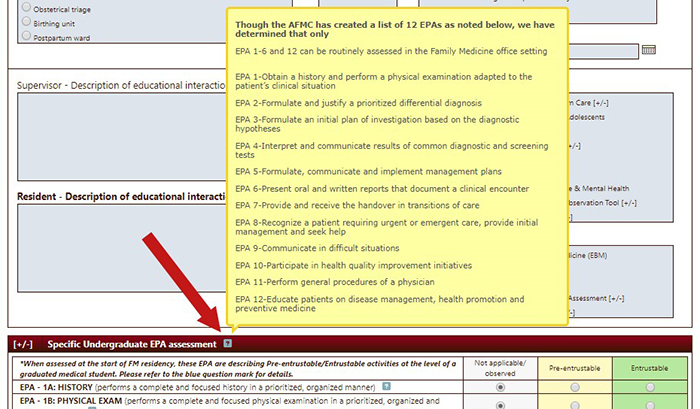 The full list of the Association of Faculties of Medicine of Canada (AFMC) EPAs appears when clicking on the highlighted question-mark in the title bar “Specific Undergraduate EPA assessment” (see below). 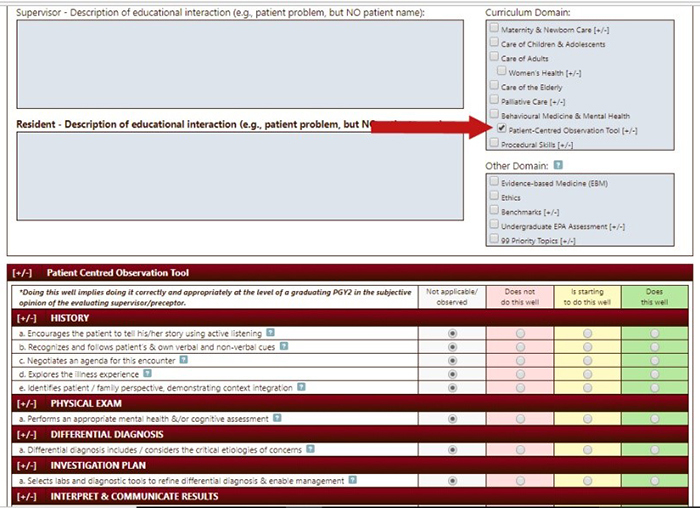 This tool is provided to allow preceptors and residents to categorically identify and build their PCOT skills. The feature appears after checking off “Patient-Centred Observation Tool [+/-]” (subcategory of “Behavioural Medicine & Mental Health”) in Curriculum Domain (see below). Though the full list of 19 competencies can seem overwhelming, there is no need to use all categories (and it is possible to collapse the unused ones). Question-marks associated with each competency provide a brief additional explanation (see below). Field Notes are documentation of direct observation and feedback and need to be timely. Those that linger in a residents’ and faculties’ Inboxes just create clutter and it is often unclear as to when the eFN is complete. Contact Dr. Gary Viner (gviner@uottawa.ca) with your questions or concerns.